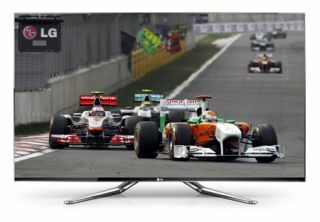 LG's 2012 Cinema 3D TV range lands in the UK | What Hi-Fi? We first saw LG's 2012 TV range at CES back in January, and last night the Korean electronics giant introduced its line-up in the UK, with sales due to start in the next week. At an official launch in London, LG introduced six Cinema Screen 3D models, with enhanced smart TV functionality and a super-slim 1mm bezel. The full line-up comprises: LM960V (top), LM860V, LM760T, LM670T (read our exclusive review here), LM660T/669T and LM640T. All the above models use passive 3D tech "for a more comfortable viewing experience", says LG, and come with five pairs of 3D glasses which are 20% lighter than last year's ones. Other tech highlights include LED backlighting and Dual Play gaming functionality, which enables two players to each see a different full-screen image on the screen at the same time. LG's Magic Remote allows gesture and scrolling control of the TV, with voice control being added on top-end models later this month. As for Smart TV, there's a new Homepage with Bing search, an integrated YouTube interface with 3D content, and Netflix will be added by the end of April. LG has also struck a deal with All3Media to develop a smart TV app bringing pay-per-view, video-on-demand content at 49p per episode for popular TV shows such as Skins and The Only Way is Essex. For those who already have a TV but want to add LG's smart TV functionality, there are two 'smart TV upgraders' – the SP250, available now, and the SP820 due in May. Also introduced were four '3D sound' Blu-ray home cinema systems, including the BH9420TW with four tallboy speakers, and the LG BP620 standalone Blu-ray player (below). LG has also confirmed that it will introduce Google TV in the UK in 2013.